Inkgard Black MICR Cartridges allow you to print bank compliant checks using your printer. 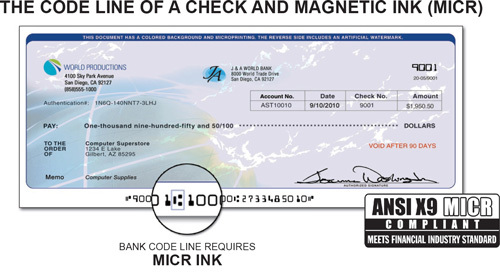 When printing checks using inexpensive blank security check paper, Magnetic (MICR) cartridges ensure that your printed checks will comply with US Federal & Canadian bank regulations. Inkgard black MICR cartridges are superior for check printing and all your other printing needs. With Inkgard black MICR cartridges and the right check design & printing software you can save 50-80% on check paper vs. buying pre-printed checks from your bank or mail-order check supplier. Check creation software is available from many sources online and in office/computer superstores. Please also visit http://check-writing-software-review.toptenreviews.com/index.html for a side-by-side review of popular finance managers and check creation software applications. Inkgard Ultraviolet Fluorscent Ink appears invisible until placed under a UV light when it will appear flourescent. Invisible ink is used to add tracking and security to documents, authenticate pricing, ticket re-admission, identity verification and more. Inkgard UV ink is not limited to security applications. Any graphic or text can be printed with Inkgard UV ink so the applications are unlimited. From adding security to company checks to creating clues for a scavenger hunt, Inkgard UV Invisible Ink makes it easy. 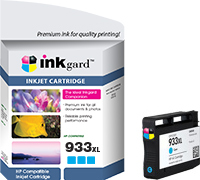 A FREE Inkgard software download to make your cartridges last up to 4 times as long will be added to the shopping cart with your initial cartridge selection! Inkgard Software works with ANY printer and cartridge model and increases yield up to 4 times (75% savings)! A FREE one year license of Inkgard software will be automatically added to your shopping cart with any cartridge purchase*. *one single-user license per year per customer - verified during check out.